Published: June 4, 2014 at 01:06 p.m. Updated: June 6, 2014 at 02:33 p.m.
Say what you want about the term student-athlete, but there are thousands of players who truly earn the moniker thanks to their work in the classroom, in the meeting room and beyond. As part of CFB 24/7's "14 for '14" ongoing series, we attempted to narrow down the list and find a few FBS players who have started on the field and are the smartest guy in the room off it. With former Penn State standout and academic all-everything John Urschel off to the NFL, here are a few players who could take his place as the sports' smartest man. The entire ACC knows how smart and savvy Crowder is on the field, but the senior is definitely no slouch in the classroom either. One of the best receivers in the nation heading into 2014, the All-ACC selection also made the Academic All-ACC team last year. We're going to guess there are not a ton of other 6-foot-3, 225-pound football players with a neuroscience major at Vandy, but we could be wrong. Hudson was the primary punter for the Commodores in 2013 and was named to the SEC Academic Honor Roll. It's going to be a different type of secondary for the Cardinal without Richards' running mate Ed Reynolds, but the senior is definitely smart enough to manage. He's pulled in a 3.42 GPA in public policy and was named a Capital One Academic All-American. Michael Sam and Kony Ealy drew most of the attention along the Tigers' defensive line in 2013, but Hoch was a stout presence in the middle and managed to grab three sacks on the season. He suffered a tough blow in spring practice after breaking his ankle, but can focus on rehabbing it after putting up an impressive 3.96 GPA prior to the semester. Spend a few minutes with Dobbs and you can understand why he makes this list. He started four games under center for the Vols last year as a true freshman, but still managed to keep his grades up in the aerospace engineering major he's picked. We're sure Alabama's defense is just as tough as honors calculus class. While his teammate Spencer Drango gets most of the attention on the left side of the line, Baker is as solid as they come as a right tackle. He's made the Big 12 Honor Roll seven times and should finish up his MBA by the time his career is over in Waco, Texas, after earning his finance degree nearly two years ago. The safety was a force in the secondary for the Green Wave and one of several reasons why Tulane experienced a big turnaround in 2013 on the field. He earned Capital One All-America honors and made the C-USA All-Academic team for the second straight year. He posted a 3.74 GPA in finance and twice received the C-USA Academic Medal. 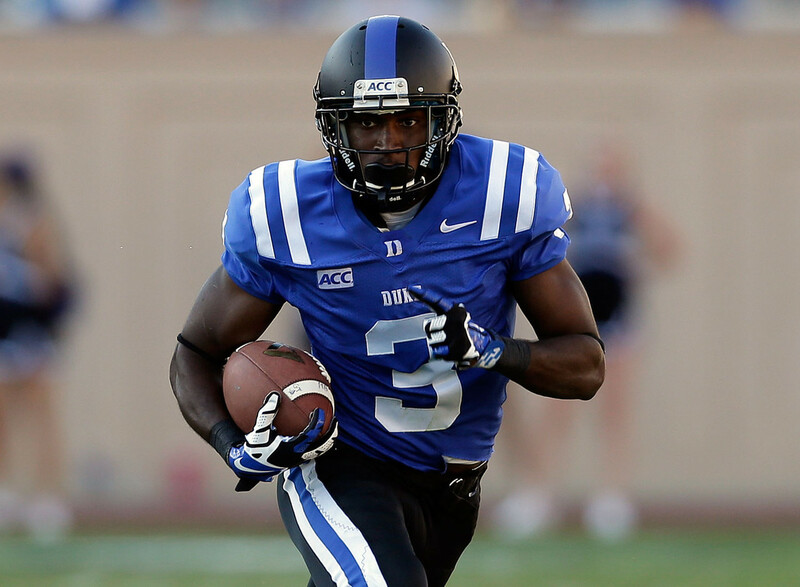 The Jamaica native has been one of the key reasons why the Blue Devils' offense has taken off recently. Tomlinson should hear his name called in the 2015 NFL Draft if he continues to progress as one of the best guards on the East Coast. He's started 25 consecutive games along the line for the Blue Devils, and is a two-time Academic All-ACC selection who is also double majoring at Duke. Murphy finished second on the team in tackles after starting 11 games and really made himself known during Big Ten play late in the season. He was an Academic All-Big Ten selection for the second straight season after posting a crazy 3.91 GPA in his major of infomatics. The Golden Flashes will enter 2014 with a pretty solid secondary and Italiano is one reason why after racking up 76 tackles a year ago. He earned just about every All-MAC academic honor you can have and did so while getting a 3.94 GPA in chemistry (pre-med). While Tennessee's Josh Dobbs is the quarterback studying to build planes, Reynolds might be the one who ends up flying them for the Navy. As if setting an NCAA record for rushing touchdowns by a quarterback wasn't enough, the busy schedule at the Academy certainly added to his workload. However, he still managed to post strong grades in his political science classes. He is perhaps one of the best centers in the Big Ten and starts off 2014 in a familiar spot on the Rimington Trophy watch list. As one of the captains of a team that has dealt with a lot of issues, Vitabile has been a spokesperson for the team on the union issue all while ending up as an Academic All-Big Ten selection. The economics major has 38 starts under his belt and counting. Adcock excelled in the classroom last year even if it was a bit of a rough one on the field after he tore up his knee after the first four of his starts for the Bears at center. He still earned a second consecutive first-team Pac-12 All-Academic selection and is on track to graduate with two degrees in business administration and interdisciplinary studies. If he doesn't get a look from the NFL, he'll likely end up in medical school after his playing career is over. The Cardinal's starting punter was a big weapon for the team on the field and brighter than you can imagine off it. Rhyne was named the Pac-12 Football Scholar-Athlete of the Year last season after posting a 3.88 GPA in biomechanical engineering. He also managed to be named to the Pac-12 All-Academic first team and won Stanford's academic achievement award.